You will notice that the lines of the execution plan are indented to indicate precedence. For example, the construction of the tuple must happen before it is inserted into the table. You can see from the plan that the scan of the CONTESTANTS table uses the primary key index. It is also a partitioned table and procedure so the results can be sent directly back to the stored procedure. At each partition, perform a sequential scan of the votes-per-contestant-and-state table. Return the results from each partition to the initiator that is coordinating the multi-partition transaction. Use an aggregate function to sum the votes for all partitions by contestant. And finally, return the results to the stored procedure. What makes the execution plans important is that they can help you optimize your database application by pointing out where the data access can be improved, either by modifying indexes or by changing the join order of queries. Let's start by looking at indexes. VoltDB uses information about the partitioning column to determine what partition needs to execute a single-partitioned stored procedure. However, it does not automatically create an index for accessing records in that column. So, for example, in the Hello World example, if we remove the primary key (DIALECT) on the HELLOWORLD table, the execution plan for the Select statement also changes. Note that the first operation has changed to a sequential scan of the HELLOWORLD table, rather than a indexed scan. Since the Hello World example only has a few records, it does not take very long to look through five or six records looking for the right one. But imagine doing a sequential scan of an employee table containing tens of thousands of records. It quickly becomes apparent how important having an index can be when looking for individual records in large tables. There is an incremental cost associated with inserts or updates to tables containing an index. But the improvement on read performance often far exceeds any cost associated with writes. For example, consider the flight application that is used as an example in the Using VoltDB manual. The FLIGHT table is a replicated table with an index on the FLIGHT_ID, which helps for transactions that join the FLIGHT and RESERVATION tables looking for a specific flight. However, one of the most common transactions associated with the FLIGHT table is customers looking for flights during a specific time period; not by flight ID. In fact, looking up flights by time period is estimated to occur at least twice as often as looking for a specific flight. INDEX SCAN of "FLIGHT" using "FLIGHTTIMEIDX"
Indexes are not required for every database query. For very small tables or infrequent queries, an index could be unnecessary overhead. However, in most cases and especially frequent queries over large datasets, not having an applicable index can severely impact performance. When tuning your VoltDB database application, one useful step is to review the schema for any unexpected sequential (non-indexed) scans. The VoltDB Management Center makes this easy because it puts the "Scans" icon in the attributes column for any stored procedures that contain sequential scans. See the following chapter, Chapter 4, Using Indexes Effectively, for more information on tuning your database through effective use of indexes. The other information that the execution plans provides, in addition to the use of indexes, is the order in which the tables are joined. Join order often impacts performance. Normally, when joining two or more tables, you want the database engine to scan the table that produces the smallest number of matching records first. That way, there are fewer comparisons to evaluate when considering the other conditions. However, at compile time, VoltDB does not have any information about the potential sizing of the individual tables and must make its best guess based solely on the table schema, query, and any indexes that are defined. Clearly, performing a sequential scan of the employees (since the department ID has not been identified yet) is not going to provide the best performance. What you really want to do is to join the MANAGER and DEPARTMENT tables first, to identify the department ID before joining the EMPLOYEE table so the last join can take advantage of the appropriate index. 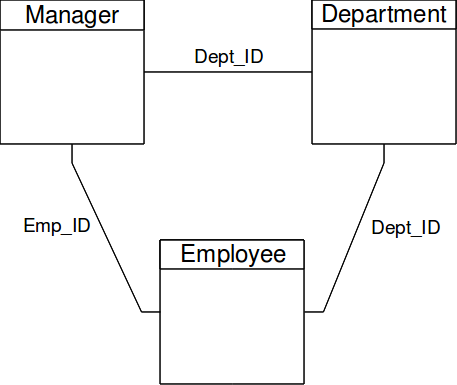 Note that where the query defines an alias for a table — as the preceding example does for the DEPARTMENT and EMPLOYEE tables — the join order must use the alias name rather than the original table name. Also, if a query joins six or more tables, you must specify the join order or VoltDB reports an error when it compiles the project. It starts with a sequential scan of the MANAGER table, a table with 10-20 times fewer rows than the EMPLOYEE table. Because MANAGER and DEPARTMENT are replicated tables, all of the initial table scanning and filtering can occur locally within each partition, rather than returning the full EMPLOYEE data from each partition to the initiator to do the later joins and sorting. Because the join order retrieves the department ID first, the execution plan can utilize the index on that column to improve the scanning of EMPLOYEE, the largest table.